Create SSP at the middle school level to help prepare students for our rigorous middle school program Act as a motivator for our middle students so they become active participants in their education Introduce and use goal-oriented language Make middle school students aware of career possibilities based on their interests and provide opportunities to explore these careers BEYOND MIDDLE SCHOOL…. Apply information gathered with Naviance, using SSP and other surveys, to make high school course choices that will start to pave the way towards their college, career or work goals. Utilize information gathered from 6th grade to 12th grade to assist with college decisions and the application process. 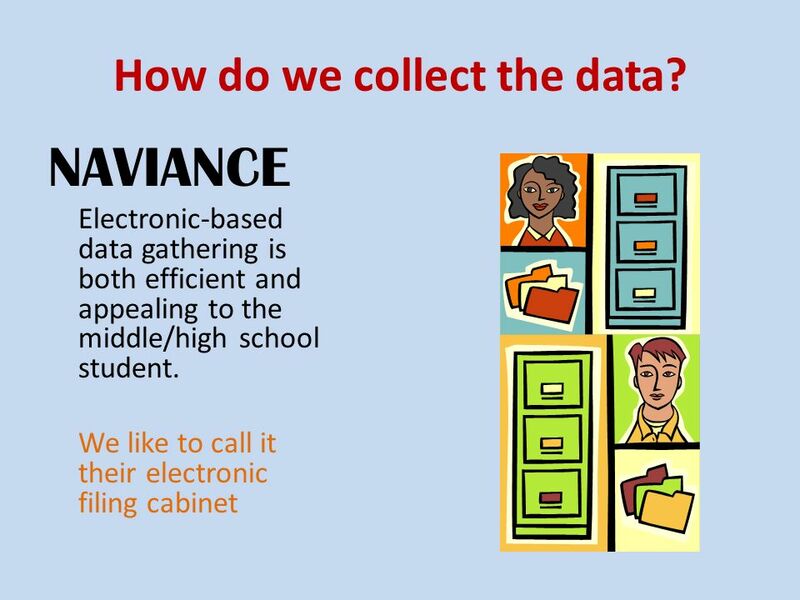 5 How do we collect the data? 6 What information do we gather? 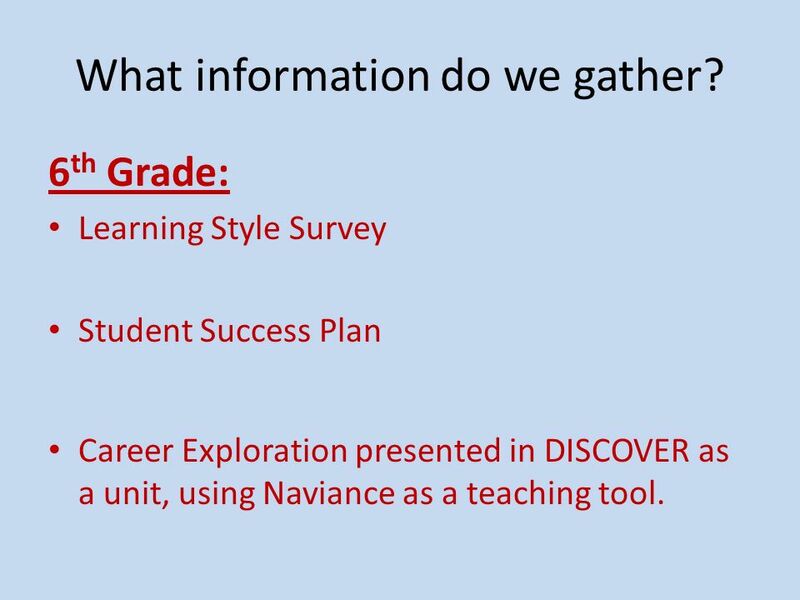 6th Grade: Learning Style Survey Student Success Plan Career Exploration presented in DISCOVER as a unit, using Naviance as a teaching tool. 7 What information do we gather? 8 What information do we gather? 11 Where does all the data go after middle school? All of the information from 6th grade through 8th grade gets rolled over into their high school electronic filing cabinet. At the high school they will continue with the SSPs and keep reevaluating their goals. In addition, they complete a “Do What You Are” survey to help guide them through college/career possibilities. Of course all of this data is very helpful when it comes to college applications (also done on Naviance). Students have access to their SSPs & Naviance during their “Connections” time, an advisor-advisee program that meets 25 minutes every week. 12 SSPs are also great for…. Red flagging students, we wouldn’t otherwise know were struggling socially and emotionally. 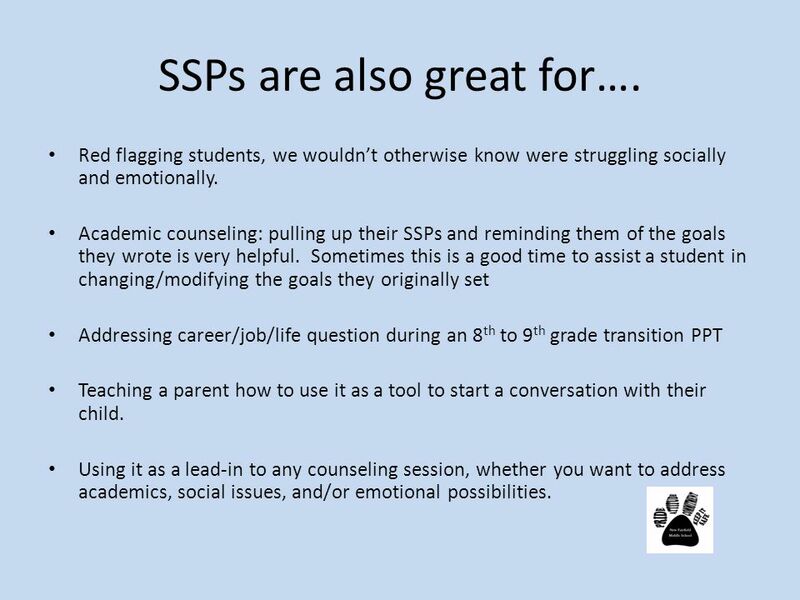 Academic counseling: pulling up their SSPs and reminding them of the goals they wrote is very helpful. 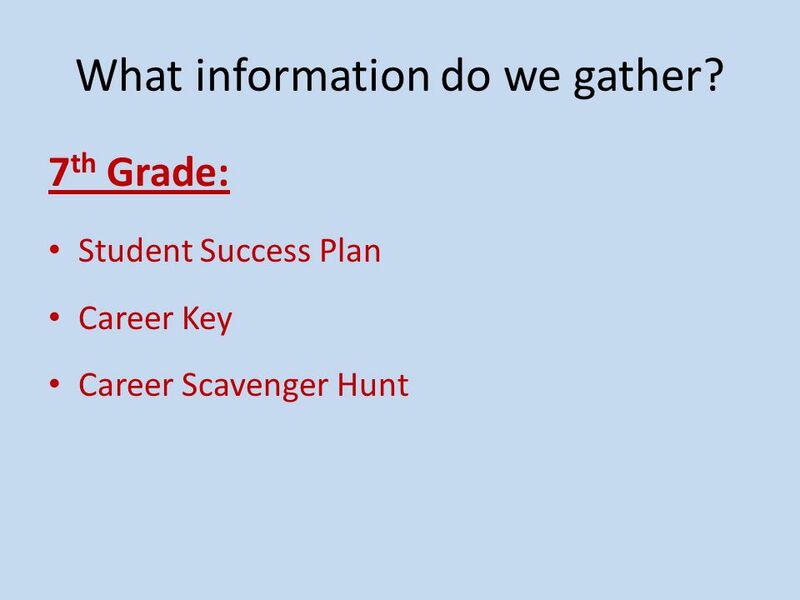 Sometimes this is a good time to assist a student in changing/modifying the goals they originally set Addressing career/job/life question during an 8th to 9th grade transition PPT Teaching a parent how to use it as a tool to start a conversation with their child. Using it as a lead-in to any counseling session, whether you want to address academics, social issues, and/or emotional possibilities. 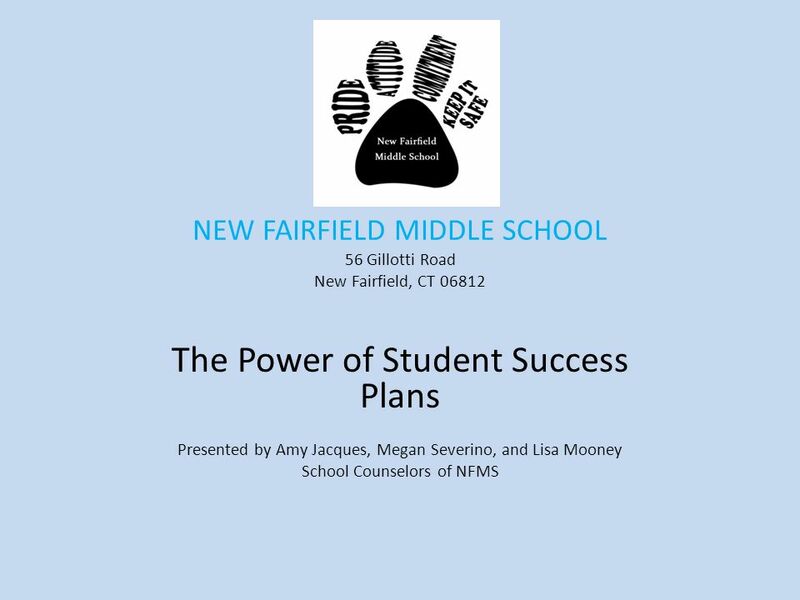 Download ppt "NEW FAIRFIELD MIDDLE SCHOOL 56 Gillotti Road New Fairfield, CT 06812"
Student Success Plans at Newtown High School Cathy Ostar, Director of School Counseling Peg Ragaini, School to Career Coordinator. School Counselor. 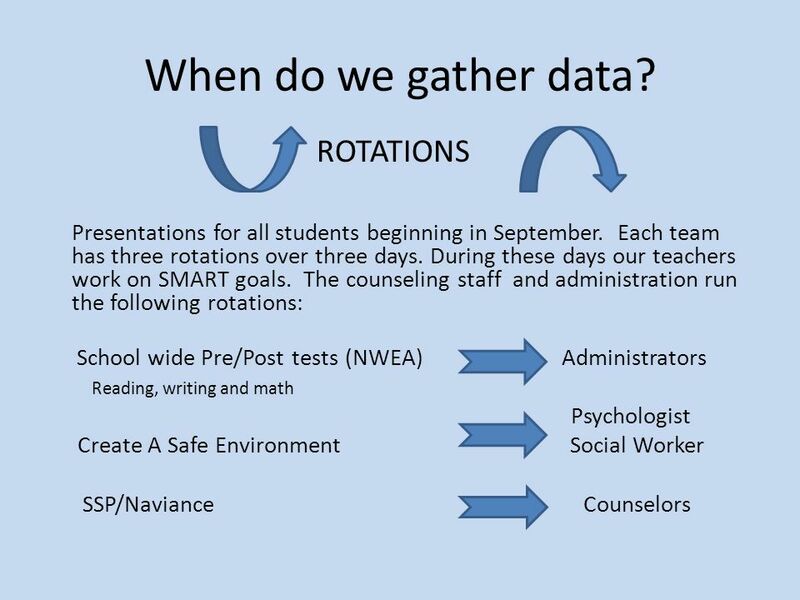 Evidence-Based School Counseling An evidence-Based School Counseling program impacts student achievement through planned and delivered. Student Success Plans Simsbury Public Schools Grades 6-12 Tor Fiske Director of Guidance Simsbury Public Schools. Student Success Plan Connecticut State Department of Education 2012. Delaware Student Success Plan. 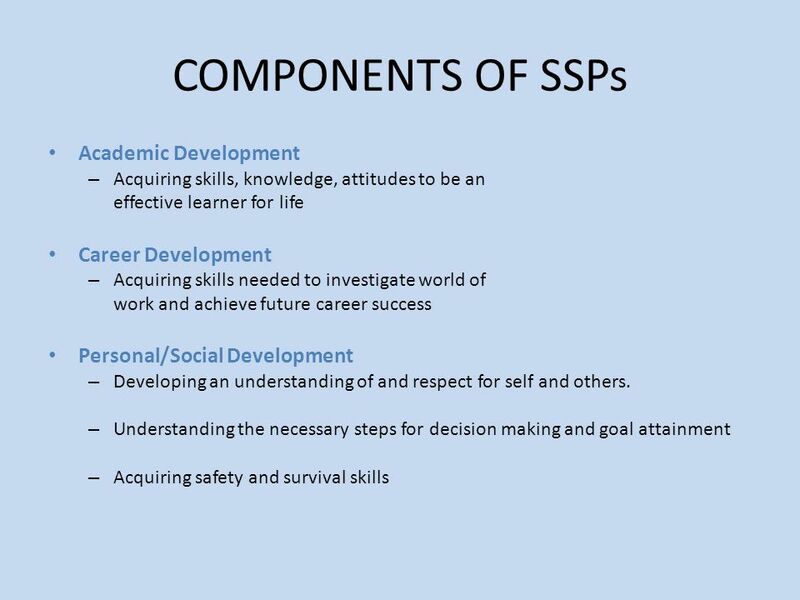 This year, the Delaware Department of Education is introducing Student Success Plans (SSPs), a new program designed to. Developmental Guidance Program Counselors Jessica BakerJason Miller Domenick DiDomenicoCristina Rivas-Laline Joseph IzzoSara Schaffer Neil LasherJennifer. Assuring students are college and/or career ready. Mission: To increase student success and student engagement by building collaborative relationships between students, staff and faculty. Concept: Provide. Education and Career Planning – A Process not an Event! Career Cruising and the Portfolio. Career Action Planning Best Practices Module 2 Benefits, Buy-in and Communication. WKMS School Counseling & Advisement Advisory Council December 5, 2012.